Wicliff resided at 20 College Gardens, Belfast. He was educated at "Inst," Belfast, and Trinity College, Dublin, where he took his B.A. (Senior Moderatorship) and gold medal in English Literature in 1902. He then entered Queens College, Belfast, qualifying ; M.B., B.Ch., B.A.O., R.U.I. in 1907; and F.R.C.S.I. in 1912. After a term as resident in the Royal Victoria Hospital, Belfast he studied ophthalmology and otology in Vienna, and on his return in 1910 was at once appointed Ophthalmic Surgeon to the Belfast Hospital for Sick Children and as Assistant Surgeon at the Belfast Ophthalmic Hospital - both of which he was consulting surgeon at the time he died. He was also appointed Clinical Assistant at Benn Eye, Ear & Throat Hospital; and Consultant Ophthalmic Surgeon at the Co Antrim Infirmary, Belfast and at the Maltern & Forster Green Hospitals. He also became a Member of the British and the Ulster Medical Associations. Wiclif joined the staff of the Hospital Corps in 1911. At the outbreak of war he served as a combatant officer with the 10th Bn. Royal Irish Rifles but was transferred to the R.A.M.C. as an ophthalmic specialist. 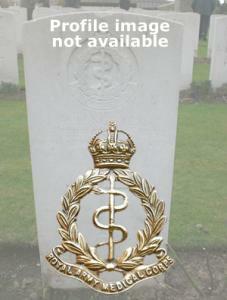 He reported for duty with the 109th Field Ambulance on 25th May 1916 from the 10th Bn. Royal Irish Rifles, according to the war diary. In 1933, Wiclif suffered a serious breakdown in health and was subsequently forced to retire from practice. He went to live on a farm he had previously bought, which overlooked the waters of Strangford Lough. He was the third son of the Rev. E M McCready (who was also a graduate in medicine).